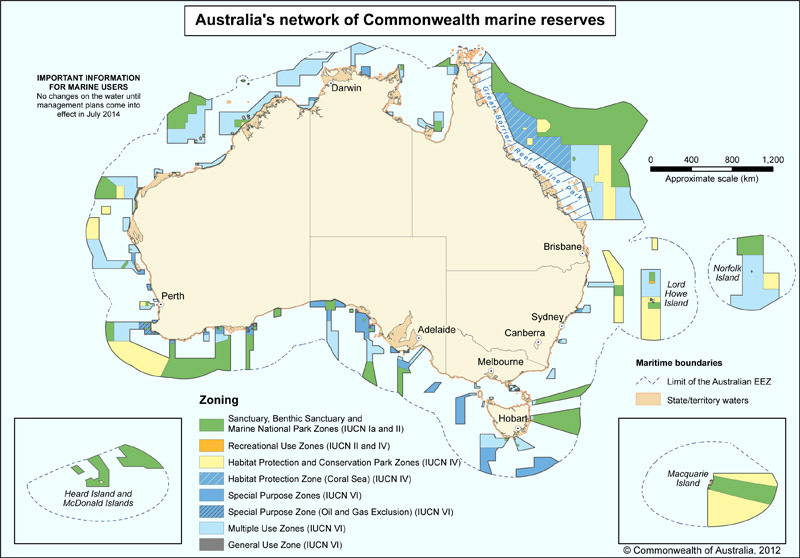 The Australian government is finally making due on their promise to reevaluate the proposed management plans for the country’s network of Commonwealth Marine Reserves. The initial management plans, released in 2012, would have encompassed 2.3 million square kilometers of ocean including a completely no-take zone covering more than 500,000 square kilometers of the Coral Sea. However, with new leadership in power, independent review of the management plans and consultation is taking place to help restore the confidence of stakeholders with special attention to recreational fishermen. This means listening to the voices of the estimated 5 million recreational anglers across Australia. Numerous user groups strongly opposed the original management plans and the controversy over marine reserves became a major political point for 2014 elections. Angling groups asserted that the boundaries and management plans for these reserves was not based on sound scientific evidence and public consultation fell greatly short of fully comprehending the uses and needs of stakeholders. Anglers are getting even more support from the work of the Australian Recreational Fishing Foundation who, like groups in the US, are working towards establishing a Recreational Fishing Council to coordinate with policy makers. Australia has one of the highest participation rates in recreational fishing for all developed nations and nationally generates close to AUD $2 billion annually in direct expenditure alone. Loosing access to iconic striped and black marlin fishing grounds off of Queensland and New South Wales would spell the end of many charter business and in particular the specialized mother-ship operations catering to high-end clients. The current Minister of the Environment, Greg Hunt claims that the creation of marine reserves were “rushed through by the previous government.” Initial socioeconomic assessments conducted by the Australian government did not even estimate the impact that the reserves will have on recreational and charter fisheries. However, independent assessments conducted in Queensland estimated that if the marine reserves in the Coral Sea were implemented, it could spell a loss of AUD $15 million annually and the loss of half of all charter boats in the Cairns fleet. In fact, these independent assessments predict that the actual impact of the reserves will be closer to the order of AUD $1 billion, more than three times the amount estimated by the federal government. The new government however, has taken the advice of organizations like TBF to now strive for a “sensible balance” between protecting the environment and the cultural and recreational benefits that we get from it. 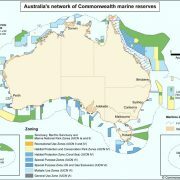 Even extreme environmental groups like PEW have waivered from their radical position of advocating for the entire Coral Sea to be a no-take reserve and they themselves claim will be taking a more “balanced” approach it their upcoming submissions to the Australian Government. Unfortunately, PEW still does not recognize that in the Coral Sea 97% of all billfish are released and it is a non-extractive activity. During consultation that took place during 2012 and 2013, the voices of the true stakeholders that would be affected by establishing any reserves was drowned out by the overwhelming influence of powerful environmental groups. Analysis of comments submitted reveal that 99.7% of all submissions were generated by conservation groups and roughly 75% of all submissions came from outside of Australia. It is interesting to note however that in the first round of submission, 99.9% of submissions pushed for greater protection in the Coral Sea (more no-take zones) while less than .1% of all comments specially stated that recreational and charter fishing be further restricted. Clearly, the volume of foreign submissions generated predominately from conservation groups cannot reflect the true values of the region. For the upcoming round of consultation, the government has taken steps to ensure that they do not repeat the same mistake. Independent Regional Advisory Panels have been established to conduct consultation, survey stakeholders, and collect relevant information. The Expert Scientific Panel will work in conjunction with Regional Advisory Panels to review the relevant science behind the decision making for the proposed reserves. The good news for the recreational sector is that TBF Rybovitch Lifetime Achievement award recipient, Dr. Julian Pepperell will be on this panel to help represent the needs of anglers. The review panels are currently conducting consultation and are slated to report their findings to the government sometime in mid-2015. Right now, TBF is drafting a position statement to let the Australian government that sportfishing and conservation should go hand in hand. Keep an eye out for comments from TBF and all anglers are encouraged to fill out an online survey and provide their own comments by the February 28th deadline. Please contact Michael Kelly for more information.